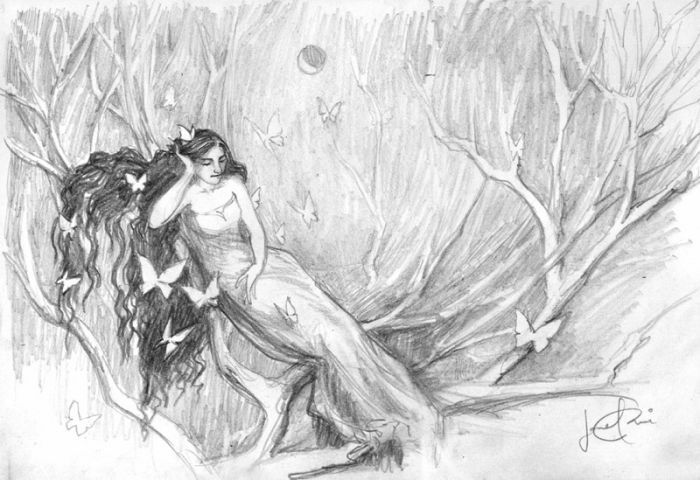 Butterfly Night: Pencil sketch. All rights reserved. I was around thirteen years of age when, on vacation, I found myself having a strange experience at night in the resort hotel in Trengganu, West Malaysia. I was woken up by the sound of people talking, and when I opened my eyes, the talking stopped. The room was dark, and my family was asleep, and I was lying on my side. Figuring I had dreamed the voices, I closed my eyes, and heard the voices start up again. They weren’t particularly loud, but they were clear (instead of sounding like they were coming through the wall), and it was all in a language I didn’t understand. I wasn’t particularly afraid; in fact, I proceeded to open and close my eyes to test the consistency of their behavior (open–silence, closed–back to talking) and I did this till I got tired and fell back asleep. Some recent travel to Malaysia this past weekend made me aware that I do have strange sleeping/dreaming experiences when traveling in this region. I don’t chalk it up entirely to the places (although its probably related), but I do have a history of slipping into unusual and altered states of consciousness during sleep that are not merely lucid dreaming; I am sleeping but conscious–aware that I am sleeping in a new place, and I am dreaming of possibly other places while at the same time being conscious of my physical body, its location, its surroundings and so on. I think travel “helps” me achieve the altered states by making me hyper-aware of new surroundings. While sleeping/dreaming, this makes for a split awareness that is not uncomfortable–it just feels like super-conscious multi-tasking. In “hostile” places, I don’t like staying in this state–it can attract unwanted attention from local entities as I become aware of my nonphysical body. In safe places (my own bed for instance, or as on the most recent trip, a hotel room with two other high-vibrational and awake companions), the dreams can become weird and oddly illuminating. LALALALA I can’t hear you. I’m cheating if I listen in on this conversation that isn’t mine. I’ve had more than enough of this “extra information” lately and I don’t know what to do with it! In the dream, the two friends stopped for a moment, then continued, while I put my dream hands over my dream ears and repeated the request. It went quiet and I returned to normal sleep. I shared later with my travel companions that the TV voices had entered my dream in an interesting way, that what was indecipherable speech to me when awake had became relevant speech in my dream. Overall, a very amusing experience! Pent-up energy/tiredness–this is not contradictory to me; I think it comes from having a day that involved different physical activities or levels of physical activity. The body can be tired/lethargic while the mind is awake. The awake mind can be a result of meditation habits and/or the events of the day before. Travel in certain regions, for me, seems to give me the “perfect storm” of factors to reach altered states. I’ve noticed that I do not get these experiences in places with more beneficial and nurturing energies. My nine nights in Glastonbury in December 2013, for example, were the deepest and most dreamless sleep I had in recent memory. Maybe it is something about the hotels in the Southeast Asian region, then! In which case…. Don’t panic! Even with unfriendly entities around in an altered state, one has protections and options to take. The “worst” that can happen is that one wakes up to an elevated heart rate. In which case, you wake up and do your prayers or whatever you need to. You’ll know you’ve started to go “pro” when you can act in your weird dream state without panicking and waking up. Practice in waking and dreaming how to call helpful and protective companions to you. Even if you may not have the abilities yet to master your state of mind/heart (staying clear of fear, keeping your focus on light and love), one can always remember that, with will and intention, everything is entirely under your control. Do not give up this truth for anything. It is a long-time opinion of mine that many of us can continue our spiritual pursuits and learning while dreaming. Sleep-time altered states are like no other experience in making one aware that one is a spiritual being only temporarily tied with a physical body. We spend one-third of our lives asleep–we may as well have fun with it!